any sauce and veggies you like. I have not used Ajinomoto (monosodium glutamate/MSG) to prepare it. And still, it tastes delicious. 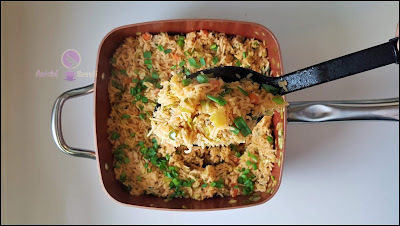 This recipe of fried rice is mildly spicy, so kids friendly and goes well with tiffin box too. Fried rice made with basmati rice, vegetables and flavored with soy sauce, that's how I have made this Indian meal with a Chinese twist. This vegetarian recipe is served as the main course. You can accompany it with gravy Manchurian or raita. Which rice I have used? 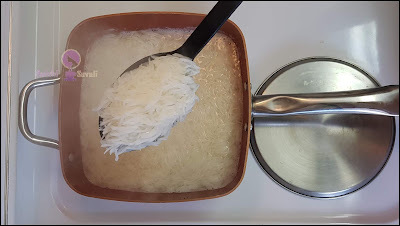 I have used basmati rice(long grain white rice). To make any type of Fried Rice, always use non-sticky rice and cool the cooked rice entirely before using in fried rice recipe. You can cook rice in advance and refrigerate it, that will work well too. Which Sauce I have used? I have used soy sauce, chili sauce, and sriracha, but you can also add Schezwan sauce instead of Sriracha and chili sauce. These all the sauces are high in sodium, so use them in moderation and do not add them often in your diet, it may cause health problems. Also try to avoid sauces (mainly soya sauce) which contains MSG, before buying check the ingredients. Which Vegetables I have used? 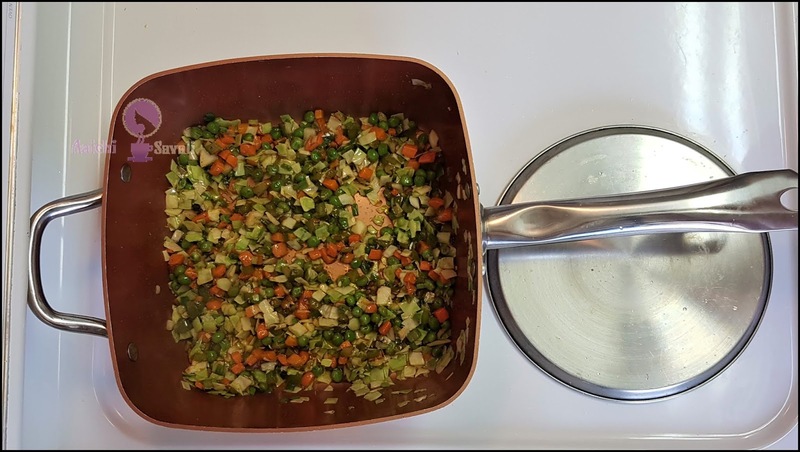 I have used cabbage, green peas, spring onions, green pepper, and carrots. But you can also use French beans, paneer, cauliflower, mushrooms, snow peas according to your choice. Fresh Veggies or Frozen Veggies? 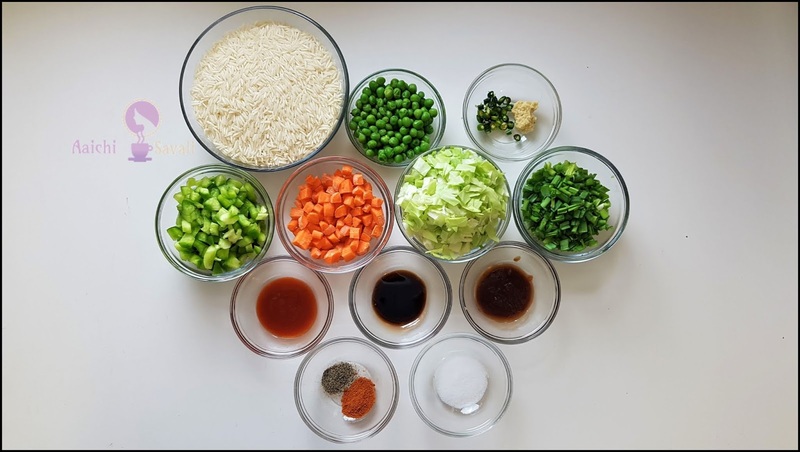 Always use fresh veggies as frying them adds crunchiness to the cooked rice and frozen vegetables let out moisture and turn soft, so try to avoid adding frozen vegetables. Each Serving of Fried Rice Contains 210 Calories. Wash rice and soak in water for 15 minutes. Bring 8 cups of water to boil in a pan and add a few drops of oil. Drain the water from rice and add it to the boiling water and cook for 10-12 minutes, stir in between. 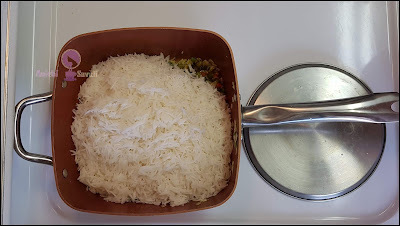 Drain off the rice and add cold water to stop the cooking process. add green chilies and ginger garlic paste and stir well. Add chopped green pepper, carrots and saute and cook for 2-3 minutes. Now, add green peas, spring onions, and cabbage, saute and cook for 1-2 minutes. Next add red chili powder, black pepper, salt and mix well. Add soya sauce, chili sauce, and sriracha and stir well. Lastly, add cooked rice and mix well and cook for 2 minutes. Garnish with fresh spring onions and serve hot and crunchy fried rice with Veg Manchurian. Enjoy!!! While cooking rice, the addition of oil helps to prevent the rice from turning mushy/sticky. 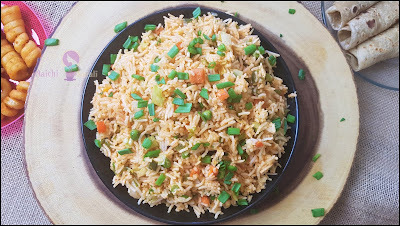 To make egg fried rice, you can just stir in an egg after frying the veggies, and your egg fried rice is ready. It makes 8 servings. Calorie count is based on a 2000 calorie diet. Per serving contains 210 calories, along with 43.16 g carbohydrates, 1.73g fats, and 4.72g protein. Carrots are loaded with vitamin A, C, E, and K, fiber, protein, and many nutrients. Vitamin A in carrots helps to improve the vision; also it is a good source of beta-carotene, which supports the skin by blocking the UV rays. Metabolism boosting compound and their high vitamin-C content green peppers can help you lose weight. Peas are low in fat but high everything nutrients, lots of protein, fiber, and micronutrients. Peas help to prevent Alzheimer’s, arthritis, bronchitis, osteoporosis, and candida. It has anti-aging properties, helps to prevent wrinkles, makes skin healthy. 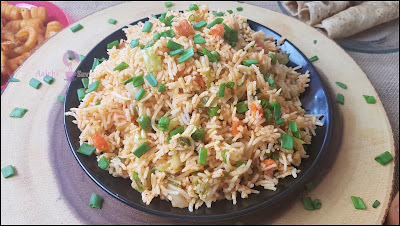 It is good to eat veg fried rice for lunch, brunch or for snacks.